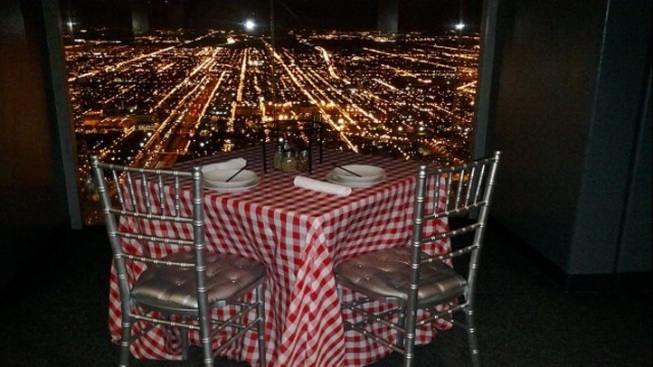 The Willis Tower Skydeck dinners can be reserved for 2-8 people. Chicagoans can now enjoy a pie in the sky -- literally. Giordano's Pizza and the Willis Tower have hooked up to offer pizza dinners for two on the Skydeck and The Ledge. The dinners are available seven days a week after hours, but reservations are required two business days in advance. Officials didn't say how much the dinners will cost, but the price depends upon the size of the dinner package ordered, which can range from two to eight people. Pizzas are of course offered, along with salad, desserts and soft drinks. Sorry, no alcohol. Reservations can be made by calling (312) 875-9447.